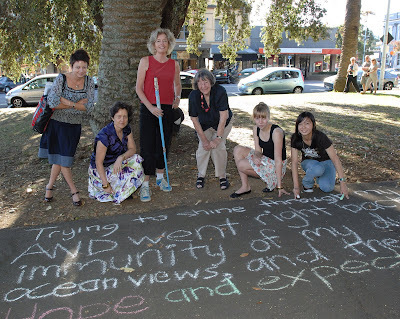 Chris Cole Catley, convenor of the recent North Shore Young Writers’ workshops for the Michael King Writers’ Centre, has kindly sent along photos taken during the final afternoon, when writers, chalk and Sunday strollers shared pavements around the library in Devonport. The 5 April workshop had begun a couple of hours earlier, taking for its keywords location, collaboration and performance. Using each other as sounding boards, pairs of students started by carefully detailing their movements (actual or fictional) from waking that morning until walking into the writing workshop. The hubbub of voices then gave way to intent scratching of felt tips on A3 as everyone got their morning down on paper. More noise as partners read and responded to each other’s drafts, then a round-the-room reading followed by simultaneous rendition, everybody and everything all at once. There is something immensely satisfying about making a ruckus in a library. Well, in a library seminar room. Part two of the exercise involved taking a page each of the Sunday newspaper and with the help of a partner’s stabbing finger, finding interesting fragments to insert between the lines of the personal text. POETRY IS NEWS was the title we gave to the juxtapositions of life and newsprint that ensued, and a massed rustling of newspaper was improvised between voices in the spirited reading of it. Some of the NEWS made it to the pavements outside, then it was up the hill for afternoon tea and farewells at the Michael King Centre. Top: Students (right) Augusta Connor and Melissa Low. Tutors (from left) Jo Emeney, Ros Ali, Michele Leggott and Chris Cole Catley. Photo credit: Martin Cole. 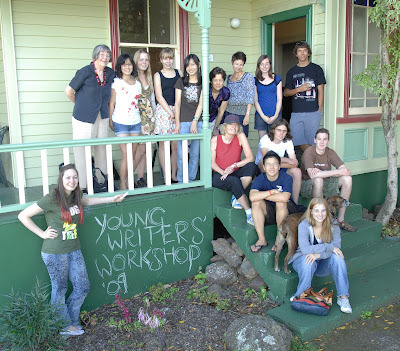 Bottom: Back row from left at the Michael King Centre on Mt Victoria, Devonport: tutor Chris Cole Catley; Donna Chan, Glenfield College; Jenny Matthews, Takapuna Grammar; Augusta Connor, Kristin School; Melissa Low, Long Bay College; tutors Ros Ali and Jo Emeney; Lydia Warren, Northcote College; Liam Winter, Rosmini College; next row, guest tutor Michele Leggott; Leighton Watson, Rangitoto College; Alex Simmonds, International College; front row, Peter Yoo, Rosmini College; Kaitlyn Crabbe, Kristin School; front at left, Katie Carey, Rangitoto College. Photo credit: Martin Cole. Thank you for an enjoyable read. I like to see what other tutors are up to. I like the way you have taken language outside and are writing on the street, on the house, and everywhere. Washable chalk is great, because then you can wash it off and write again. Ingenious ideas.